Put your best food forward with this DIY foot mask recipe that will exfoliate and hydrate, leaving feet ultra soft and moisturized! Has stuffing your feet into thick socks and boots all winter left your feet calloused, dry and cracked? A trip to the DIY at-home foot spa may be just the answer to bring your feet back to life. With spring and summer just around the corner, it will soon be time to ditch the boots and break out the sandals. A hydrating foot mask will give your skin a moisture boost and have you ready to put your best foot forward in the coming warmer months! 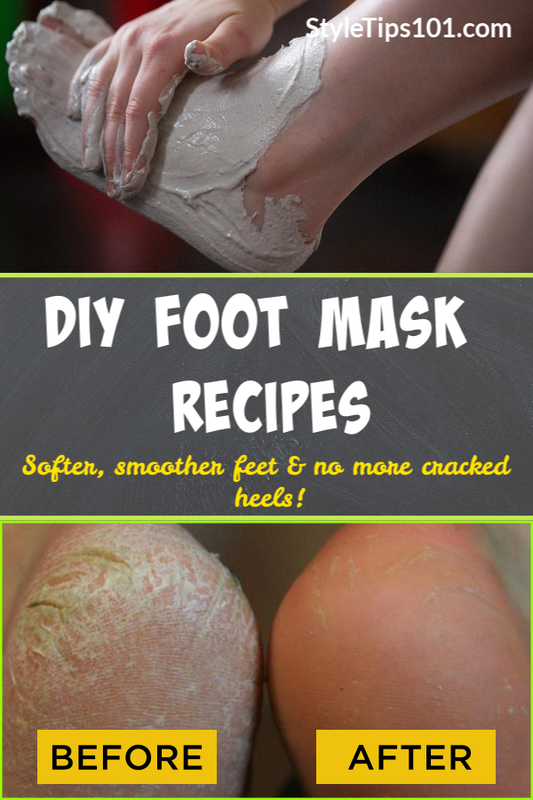 This DIY foot mask is super easy to make and will leave your feet silky soft! All you have to do is apply it and let it sit overnight! Say hello to silky feet in the morning! Coconut oil is a super moisturizer and oils like olive and jojoba are nourishing and easily absorbed by the skin leaving it smooth and soft. Vitamin E oil is especially beneficial for healing dry, cracked skin and honey helps soothe irritations and further lock in moisture. Combine all ingredients in a bowl and stir until well blended. After washing the feet and while the skin pores are still open, liberally apply the mask to both feet massaging each foot for 2 to 3 minutes. Put on old socks to help lock the ingredients on the foot and keep from making a mess. Wear overnight and in the morning remove socks and rinse off anything that was not absorbed into the skin. The acidity of lemon juice breaks down dead skin and brightens dull skin and nails. Cucumbers are hydrating and have a cooling effect that refreshes tired skin. Combine all ingredients in a blender and blend until the mixture is un-clumpy and smooth. Wash the feet and pat dry, then apply the mixture to the feet and gently massage each foot for 2 to 3 minutes. Wrap both feet with plastic or saran wrap and let sit for 15 minutes. Remove the plastic wrap and rinse feet with warm water and pat dry. You can use any or both of these DIY foot masks as often as needed, but for super soft feet, we recommend once or twice a week!